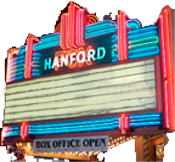 Thank you for understanding that ALL ticket sales to events at the Hanford Fox Theatre are FINAL. The Fox Theatre holds no guarantees that you will enjoy the presentations, but we certainly hope that you will. We will make every attempt to satisfy our customers. Since many of these are LIVE shows, the theatre has no control over what the artists will say or do on stage, duration of performance, and in many cases whether or not there will be an opening act or how long that opening act will play. We encourage patrons to be respectful of others by turning off their cell phones and or limiting their conversations, but for obvious reasons, this cannot be 100% controlled. We ask that all patrons be at least 5 years old. No strollers, backpacks, over-sized purses or luggage. We require that all patrons must have some sort of footwear and no tank tops for men. Thank you for your understanding and for your patronage. We hope to serve you soon at the Historic Hanford Fox Theatre.